Clayton had his basement filled in by Messier, the same company that lifted his house. 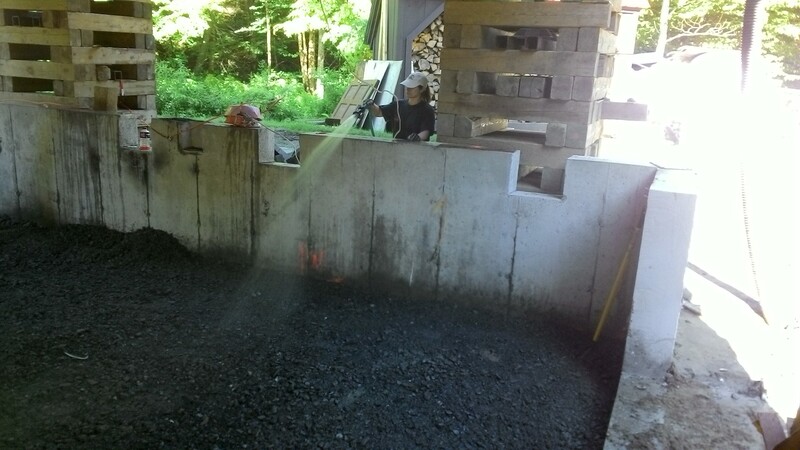 The Messier crew walked a vibrating compactor over each layer of fill to make it as dense as possible. As the engineer, I had the final say as to whether the fill was sufficiently compacted. So how did I do that? The most convenient way to test the density of a fill material in place is to take a sample. 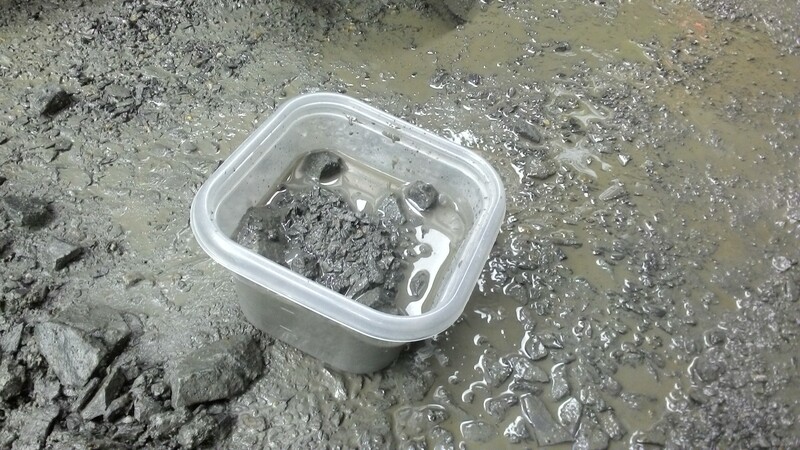 For starters, I excavated down 8 inches, because the surface doesn’t compact much at all – the vibrating device actually loosens surface fill while it compacts the fill below. Then I scooped out a sample from that depth, with a volume of about two cups. I was very careful to ensure every particle I scooped out made it into my storage container. Now with just a few extra bits of information – the density of the sand (which I know ahead of time), the volume of the cone (standardized), and the mass of the apparatus before and after the test (use the scale on-site) – I can calculate the density of the fill I scooped out. 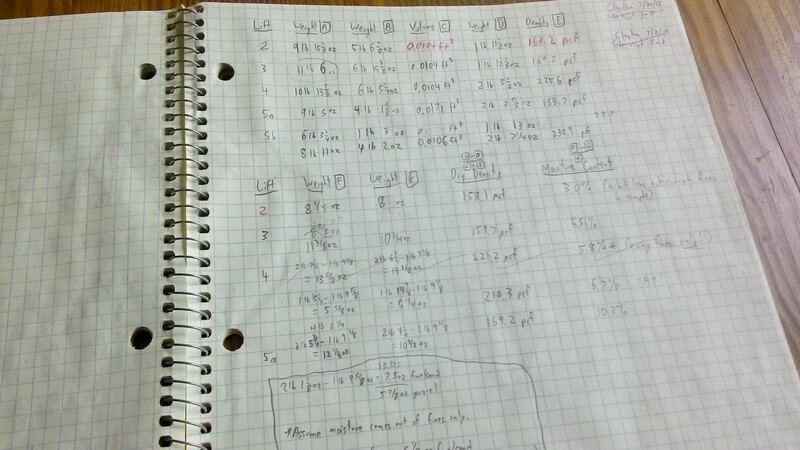 Field notes from my compaction testing. I’m not done yet. 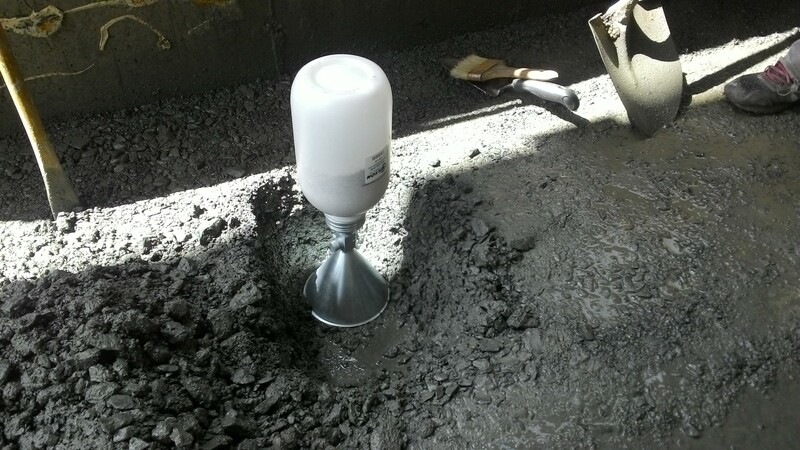 Proper compaction depends not on fresh-out-of-the-ground density but on DRY density. And the most convenient way to dry a sample quickly is with… wait for it… a microwave oven. I borrowed Clayton’s for the task, checking the decreasing mass of my sample after each minute until the mass stabilized. Finally, I calculated the moisture content of the original sample by comparing the fresh-out-of-the-ground density with the dry density. As it turned out, Clayton’s compacted fill had a dry density well above the minimum density I specified. (Great work, Messier!) 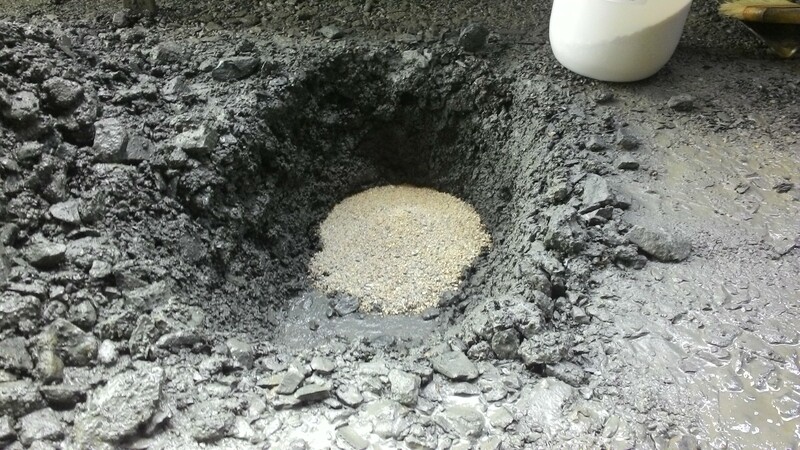 The moisture content however was a little low at first, meaning the fill was too dry. Fortunately, the remedy for this compaction issue is simple: just add water. Sandra spent a long morning spraying the entire excavation with a hose, and my last few samples had a moisture content exactly where I wanted. Sandra on spray duty aims for a perfect moisture content.